It's true that I've been in sort of a functional craft mode lately. Never discount the pleasure to be had in simple, traditional handiwork like knitting, crochet and sewing. Whether the end result is "artsy" or merely useful, there is something so satisfying about taking a piece of cloth or a skein of yarn and transforming it. For a gift exchange I utilized a variety of skills in progress. 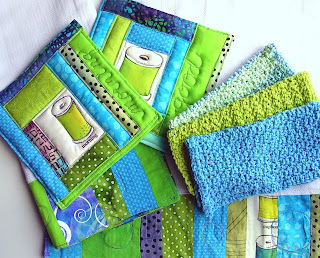 I crocheted some dishcloths in gorgeous chartreuse and sky blue, created some dish towels by adding matching patchwork fabric to the ends of a length of utility cloth, and whipped up some crazy log cabin quilted potholders. That was so much fun that I made some additional potholders for another friend. 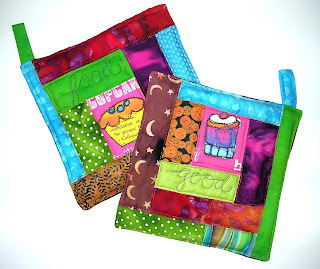 I found a use for some of my Spoonflower fabrics and other bits of delightful cloth in my scrap bin. These are, to me, small works of art. It's so satisfying to make something. Is that fabric printed with Bubble Jet like in your Stitch Imagery DVD? Merry, Merry & Happy, Happy! No, this is some of the wonderful fabric I had printed at www.spoonflower.com. You simply upload a design and they'll print a yard (or more or less) using regular textile printers. It's tres awesome! Oh those pot holders would just have to be hung on a wall in my kitchen with strict orders to the hubby to "not use those when you are making your chilli!". Those are wonderful, I LOVE the colors. I'm going to check out spoonflower too. Happy New Year! Great combination of colors the greens and the aquas...very pretty! wow. I really like this idea, with all the matching kitchen stuff. beautiful!